I’m a little embarrassed and annoyed that I haven’t written a blog post in over a year… not even a post about my 2011 goals or winning UKIPT Galway a year ago! One of my main goals for next year is definitely to update this blog more frequently. I just wanted to write a quick update about my online play lately. 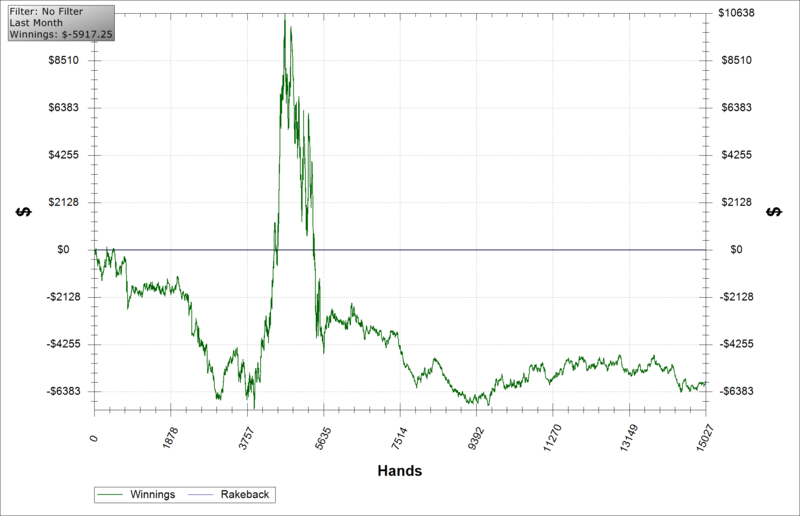 For this year, my main game online has been 10/20 and 15/30 Limit Hold’em (yes… people still play that poo-flinging variant). However, last month, I decided to take some shots. I played some 30/60, 50/100, and even 100/200. For the 50/100 and 100/200 games, I was only playing them when there was a BIG soft spot in the game. I also decided to sell 60% of myself in the 100/200 game (so I’m still playing 40/80-worth of myself). Naturally, I ran pretty terribly at the start, as you do! But then I went on to have my two best cash days ever (+$4500 then +$7700) which I was of course absolutely delighted about! Then… I had my biggest losing day ever the very next day (-$10.7k). Poker is a funny game, you can feel like you’re amazing and invincible one minute and then like you don’t even know how to play the next. These emotions are generally just a reflection of your recent results, silly human brains! 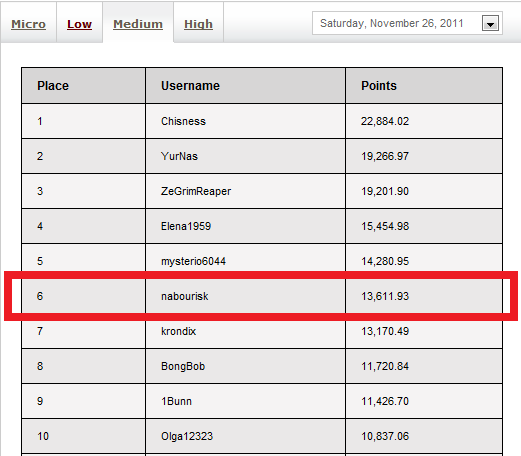 On a lighter note though, I just achieved Supernova VIP status today on PokerStars for the second year in a row! I’m still working full-time so I’m pretty proud of that. It’s interesting how these VIP programs really reel you in for years! I’m guessing the reason for most players is because it becomes an opportunity cost for them to switch their main sites when they’re already receiving a high-ish effective rakeback. Getting to Supernova was made much easier due to the Ring Game Leaderboards promotion that Stars was running. Basically, for different stake levels (Low, Med, High, etc. ), there was an amount allotted to the top point earners on each day during the promo. I had the ingenious idea (note the sarcasm!) to try to win the medium stakes leaderboard… wow, what a day! I played about 20% of my hands for the whole year in one day! Yep… 14.5 hours, 9000 hands, 13.6k points, and 2 bloodshot eyes later, I ended up finishing 6th that day. That was good for $700 but I lost a lot more than that in the process. 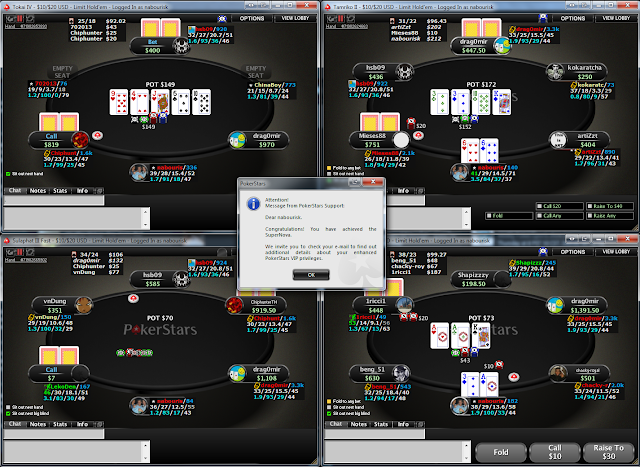 It was mad, I usually comfortably play 3 to 4 tables of 6-max but I was playing up to 9 tables for most of that day. When you add in playing a LAGgy (40/30) style and being a showdown monkey, you often have several decisions per second. Let’s just say that I was way out of my comfort zone and don’t really wanna do this again. I plan on changing my approach to blogging. Instead of long and infrequent posts, I plan on adding more frequent yet shorter posts (with a good ratio of pics/vids to text). I know that I barely have attention for anything over 140 characters nowadays and I’m sure many of you are the same. Thank God for Twitter!